The Faith 7 Mercury Space Capsule is brought on board with Cooper still inside. 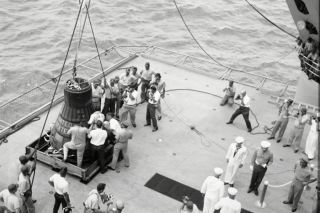 In this historical photo from the U.S. space agency, recovery personnel bring the Mercury space capsule "Faith 7" onboard the recovery ship U.S.S. Kearsarge with astronaut Gordon Cooper still inside. Once secured on deck, Cooper will jettison the Capsule's hatch allowing for his removal.